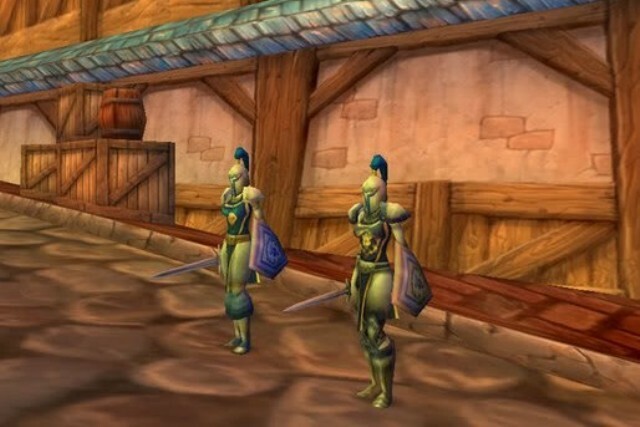 Many folks think “Oh, just use the Imperial Plate set!” for creating a Stormwind City Guard. That’s partially true, but some of the pieces are just completely wrong (the shoulders, especially). I wish I could say that the addition of the Stormwind Tabard had made this even more indistinguishable, but that tabard is terrible. Also, even the Stormwind City Guards aren’t consistent from guardsman to guardsman, so, some variation is acceptable. The guard on the left is my character, Josin. The Imperial Plate Boots can replace Boot’s Boots. Also, depending on how much you like to PVP, you can work yourself up to the Knight’s Colors tabard; however, Josin’s outfit looks just fine as is. Hope you like my take on a Stormwind City Guard outfit – I love it!